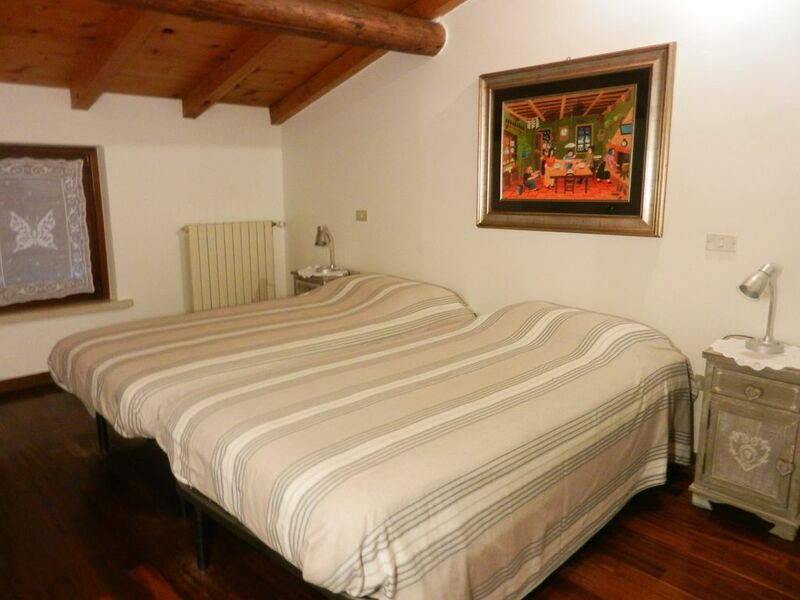 Fisherman's house renovated in the '700, comb, in the historic village (Borgo Angeli, MN), offers two rooms (four beds) with bathroom; and another room with two beds means, shared bathroom. It is located inside the Mincio Park on the bank of the river, with excellent views over the expanse of lotus flowers. Mantua is in fact one of the few cities in which they grow and, for many visitors, they make it an attraction. The Gothic style church, Dominican before, then Franciscan, holds a Mantegna school shovel: a crowned Madonna fruit flowers Angels. Of great beauty sunsets over the river. The house where the owner lives, is three kilometers from the center of cycle of Mantua; can be reached by car, bus and bicycle, it supplied the house, which has WiFi in heating and air conditioning system. Optional paid tourist boat trip. The entire house consists of 9 rooms, it has three bathrooms. Two rooms with shared bathroom and 4 beds, plus an additional room with two beds means are reserved for guests. From the windows you can see the expanse of lotus flowers and beautiful sunsets on Lake Superior. The non-swimming lake is populated by seagulls, wild ducks, coots, moorhens, squassi, herons. Who is part with the intention of returning to Mantua soon. This style of home and Mantova as a whole truly deserve a living. We spent five days staying with Emilia and Roberto in their B and B cottage. We had a great time in Mantova and a large part of our enjoyment came about because of the wonderful hospitality of our hosts and especially the delightful Roberto. Despite the fact that our Italian was at best basic and Roberto's English limited we communicated very well and he sorted out all our requests. We used the bicycles provided and spent the days riding to, and around, Mantova. When we went into town for an evening meal and a few vinos Roberto picked us up like a bunch of teenagers ( although we are in our 60's and 70's _ in fact we were comparing with our hosts who had the most grandchildren. They won with 11!!). Not the place to stay if you want a hotel with room service (the breakfasts are limited) but if you want a real Italian family experience, this is the place. Propriété et propriétaire supers. Très très gentils et serviables. Déjeuner nickel et vélos mis à disposition gratuitement et petit tours en bateau offert. Merci pour tout! Quando gli ospiti sono educati, cortesi, premurosi non è un problema aprire la propria casa; in particolare se queste doti vengono riscontrate in tre ragazzini!!! Abbiamo soggiornato 2 notti nella casa di Sandra e Roberto, gentilissimi ed accoglienti. Biciclette e cartine con vari percorsi dettagliati a disposizione. Colazione abbondante, torte fatte in casa, specifiche della zona. Bella vista sul Lago Superiore dalla finestra, con fiori di loto e cigni. Mantova è bellissima, con i suoi 3 laghi; si può andare in bici intorno ai laghi, c'è la pista ciclabile; oppure andare sulla motonave, consigliabile sul Lago Inferiore da dove si può vedere bene la città. Da fare la Mantova Card: con 20€ si possono visitare quasi tutti i musei, e in più andare negli autobus urbani e prendere le citybike, senza pagare extra. Ci siamo sentiti proprio bene, da ripetere. Premesso che siamo stati noi a chiedere se c'era la possibilità di avere una cucina a disposizione, la soluzione proposta purtroppo si è rivelata piuttosto sotto le ns. aspettative .. anziché soggiornare nelle camere del b&b (che come avremmo scoperto durante la colazione del giorno dopo è invece delizioso e molto curato e pulito), siamo stati ospitati in un appartamento indipendente a 20mt che avrebbe dovuto soddisfare la ns. richiesta della cucina funzionante: purtroppo i locali molto datati e poco aerati erano lontani dall'idea di pulizia che invece si è respirato nella sala colazioni del corpo principale .. poteva andare per una notte (capodanno) ma quantomeno con un prezzo più basso! Wir waren Anfang März zum Fischen am Lago Superiore und erlebten eine unvergessliche Woche bei Sandra und Roberto. Die Zwei waren immer sehr hilfsbereit und standen uns mit Rat und Tat beiseite. Trotz nicht vorhandener Italienischkenntnisse konnten wir uns sehr gut mit Ihnen unterhalten und jede Frage klären. Das Haus und die Zimmer waren sehr sauber, sie wurden täglich gereinigt. Wir bedanken uns für die Gastfreundschaft und hoffen auf ein baldiges Wiedersehen. Un Borgo incantato una casa perfetta! Posto bellissimo ed incantato per trascorrere weekend all'insegna della calma della natura e del relax ad un passo da Mantova centro per vedere questa bella città. Emilia e Roberto (i "nonni" di Borgo Angeli) sono perfettamente integrati in questo contesto e altro che nonni hanno molta più carica, energia e vitalità di un adolescente. Il loro modo di ospitare è incredibilmente naturale (sono perfetti per questo lavoro amano condividere il loro spazio con gli ospiti) e sono a disposizione degli ospiti in modo inpeccabile ma non invasivo e tengono la casa perfetta. Bellissima esperienza ci torneremo in estate (luglio) per la fioritura del loto sul lago. Il miglior modo per chiudere il 2015 ed iniziare il 2016. Grazie Emilia e Roberto un forte abbraccio e complimenti per la vostra energia, serenità, sinergia e innata dote di Ospitare (con la "O" maiuscola tutta meritata!!!). The property is located in the Mincio Park, a place of tranquility where you can do many activities (running, bird watching, mountain biking, ...). Distance from city center about three kilometers with path and is accessible by bus, bicycle, car. In the center you can visit museums such as Palazzo Ducale, Palazzo Te, Bibiena Theatre, Rotunda of St. Lorenzo, the church of St. Andrew of LeonBattista Alberti. You can have lunch with typical food and relax on the walk along the lake. The amusement park near you, 'Gardaland', is located in Peschiera del Garda, about thirty kilometers away from the property. A 3 km from the city is the Sanctuary of Grace, destination of pavement artists who perform on the square on the day of the Assumption. Mantua, the Gonzaga rulers of Mantua from '300 to' 600, is Unesco. He is the protagonist of the Festivaletteratura annual event which takes place the first week of September and hosts writers from all over the world. Mantova was chosen as the Italian capital of culture in 2016. Other reviews: MantovaDance April-May, Signs of Childhood in November. Mantua is surrounded by the river Mincio that forms around the city, three lakes: Upper, Middle and Lower, unfortunately not for swimming. Our house built on the shore of Lake Superior offers a view of a vast expanse of fiordiloto and spectacular sunsets. We provide a quadruple and a room with two single beds with shared bathroom. E 'strictly forbidden to smoke. I dettagli della prenotazione sono sempre relativi ad una persona E' severamente vietato fumare. C'è possibilità di noleggio biciclette, barca, canoe. Abbiamo un pulmino a disposizione gratuita per l'arrivo dalla stazione e la partenza per la stazione.Nei giorni del soggiorno siamo disponibili per il transito in centro a pagamento.